Gray skies, Texas sunsets, and a really cute pup. 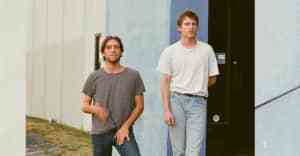 Hovvdy is Charlie Martin and Will Taylor, two guys from Austin, Texas whose full-length debut was released last year and is set to be reissued next month. Born in that distinctly bandcamp-ian vein that gave rise to likeminded acts as Alex G and Elvis Depressedly, the duo are debuting their video for Taster standout “Problem,” today via The FADER. Shot and edited by Riley Engemoen, the video — which, according to an email from the band, attempts to capture "the texture and feeling of the song" rather than the narrative — is a mini road trip in grayscale. We follow Taylor and Martin through isolated shots of small town scenery, the song's reverb-heavy chords providing a fitting soundtrack for the atmospheric haze. “I want to live here/ A couple of years,” Martin sings, and the soothing melancholy of the video world is enough to make you share the sentiment. The Taster reissue comes out 4/28 on Double Double Whammy.